Since posting: Candy or Breakfast? Evaluate Your Cereal, Snack Girl has scoured the cereal aisle looking for healthy choices. The biggest problem in finding a cereal that passes my test is SUGAR. You can imagine that if you are a big cereal manufacturer, such as General Mills, you want to be sure that people are going to buy many boxes of your product. So, it better taste great. The easiest way to make people want more of your brand of cereal is to make it super sweet. But, it isn't a good idea to start your day with lots of sugar in your system. You will crash and be hungry before lunch. When I spotted "Bear Naked Fit" advertising low sugar, I got excited. But, it cost $5 for a 12 ounce bag! Yikes! Snack Girl had been contacted by Bear Naked so I just wrote them and asked them to send me a sample. Why pay $5 and hate the stuff? 1. Is the first ingredient whole grain? Yes! The first ingredient is whole grain oats. 2. Is there 5 grams or less of sugar per serving? Yes! There is 4 grams of sugar per serving. 3. One serving must provides at least 4 grams of fiber. You can remember this one with Four Fiber. No. It only has 3 grams of fiber - but I can live with that. and it features: NO artificial flavors, NO cholesterol, NO hydrogenated oils, NO high fructose corn syrup, NO artificial preservatives, and 0g trans fat. BUT, my issue here is the price. My Stop and Shop has a very similar Granola for $2 for 12 ounces. And, get this, it also features NONE of the above evil items like Bear Naked Fit. It has 5 grams of dietary fiber and 10 grams of sugar. What to do? Well, my kids love this stuff so I mix it with Rice Krispies or Cheerios. Neither of these cereals contain a lot of sugar. Basically, I cut the store brand granola in half with the less sugary cereal. My kids get to "make" their breakfast in the morning. And, you know, it tastes pretty good. My suggestion is to try mixing your favorite whole grain, high sugar cereal with a whole grain, low sugar cereal. You get the taste without all the sugar (and maybe save some money). How do you deal with sugary cereals that you love? "My suggestion is to try mixing your favorite whole grain, high sugar cereal with a whole grain, low sugar cereal." That's brilliant! I really like the Kashi cereals with too much sugar--I mix in Fiber One and voila! More fiber, less sugar... and more fullness. Thanks for that. 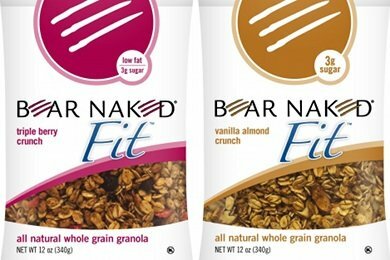 I love Bear Naked Fit, also like Feed brand granola. I am a fan of protein breakfasts so suggest cereal to clients sprinkled in yogurt or fruit. As for price, I think ingredients are worth paying for as needed. People skimp on food and pay with their health, I know that wasn't the case for you here. Good product/good post! I've tested a lot of cereals, but when it comes to the issue of calories, fiber, and sugar, there is one clear winner ... Fiber One. Throw your favorite fruit on it and you have the makings of delicious breakfast that will fill you up. I purchase it at Target ... it seems to be cheaper than most grocery stores. Oh yeah, it also makes for a good snack. Try Trader Joe's Triple Nut reduced Sugar and flakes cereal. It has 2 g of sugar, 21 g of carbs and 3 g of protein with only 130 calories for a 1/2 a cup of cereal. First off, Fiber One contains aspartame...YUK!! The hands down best cereal is Kashi Go Lean. A generous one cup portion has only 140 calories, 6 rams of sugar, 10 grams of fiber(40% of ur daily value!!) and ready for this...13 GRAMS OF PROTEIN. just a heads up that mixing half a serving of cereal w/ 10g sugar with a half serving of cereal w/ 5 gram sugar gets you a total of 7.5g of sugar for that serving you just mixed, not 5g. XD unless the "low sugar" cereal you're mixing actually got no sugar at all, the math doesn't quite add up. Position rack in the middle of the oven and preheat to 300 degrees F. [I cook it in the convection over at 275.] Grease large baking sheet. Mix first five ingredients in large bowl. Combine oil/butter, honey, and sugar in small saucepan; bring to simmer over medium heat. Remove from heat; stir in vanilla. Pour hot liquid over oat mixture; stir well. Using hands, toss mixture until thoroughly mixed. haha! I used to hate when my mom & grandma did this when I was younger, but they needed to make the food and the money stretch - now I gladly mix cereals! Great idea and since i don't have a Stop & Shop by me, I'll try the bear naked and mix it! We do the same sort of thing. We mix a high fiber, whole grain cereal with soy or almond milk and then as sort of a topping, the kids get to sprinkle on some more sweet (still something with between 7-10 grams sugar/serving.... no cocoa puffs!) on top. And then they feel they are getting a treat. We don't do cereal :-( I just cook breakfast...too many bad things in most cereals but if/when I do, I will certainly follow your advice of mixing the cereals! Great idea.